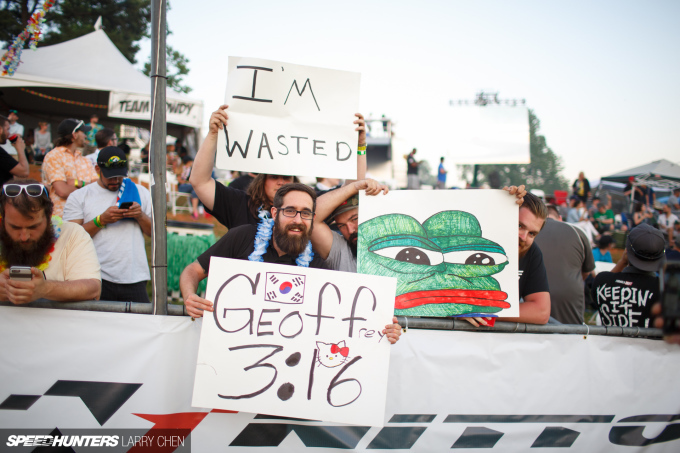 Formula Drift Atlanta 2016 marked the 65th FD event that I have covered through my lens. 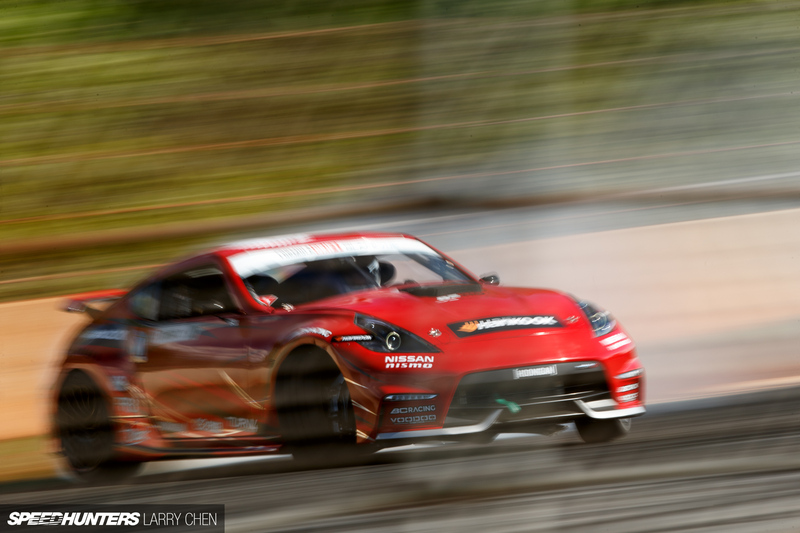 People often ask me if I ever get bored of shooting drifting; for me it’s one of those things, if you have a passion for cars then you could not possibly get bored of it. At least from a photographer’s point of view. 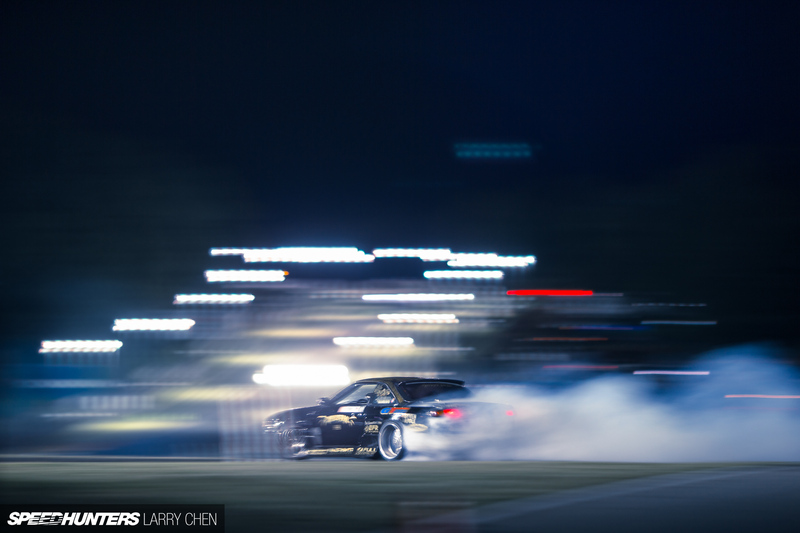 Drifting is so visual. The cars look very spiffy with new builds and new liveries every year, and I get to point my lenses at them all season long. How could you not fall in love with the variety of builds and power plants? Now more than ever, drifting is about diverse power plants making four-digit power figures. And don’t even get me started on the smoke. I’ve explained it many times before as the smoke becoming alive, as an extension of the car itself. The shape and the layers it creates is unlike anything else. 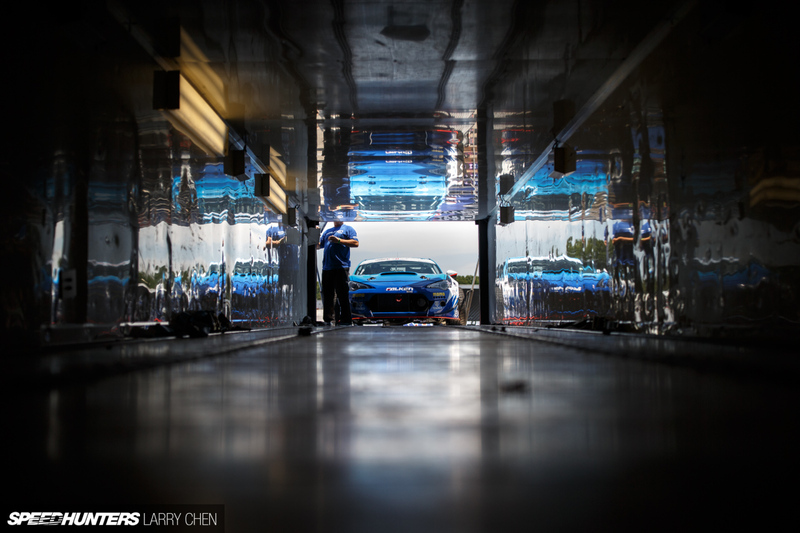 It’s the perfect motorsport for the very short attention spans of today’s motor-heads. Thirty seconds a run, and boom, you’re done; there is your winner. You don’t like it? Too bad. When you are actually at an event it’s an entirely different experience than watching it over the internet. You get a sensory experience: the sight, the smell, the taste and the sound. And if you stand close enough you get to feel it, especially at Road Atlanta where the drivers can kick rocks up onto your forehead. Below is a collection of images that I’ve gathered up and laid out in no particular order. 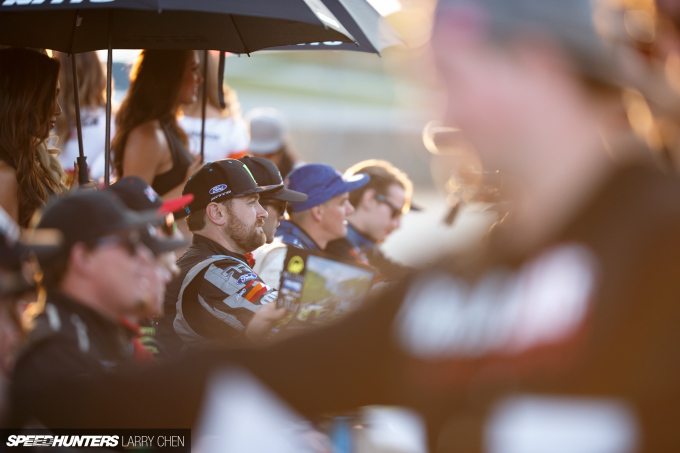 Each one is a moment in time from Round 2 at Road Atlanta. Enjoy! 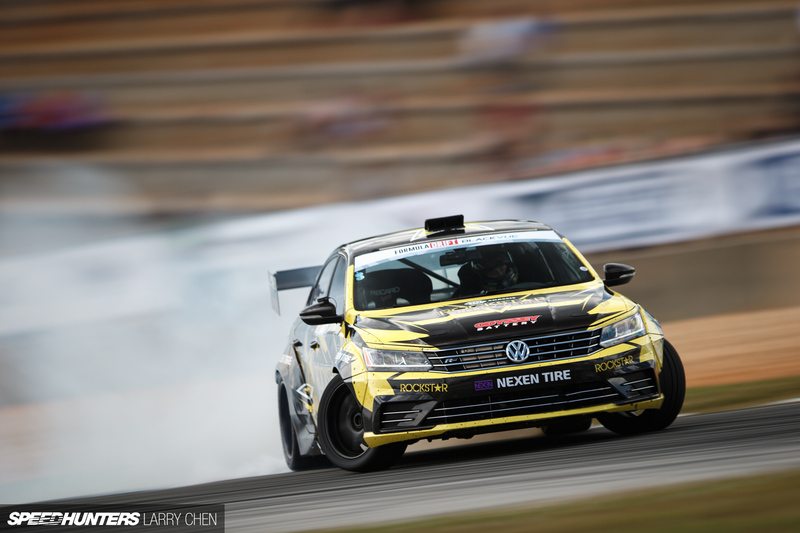 It’s always nice to see Tanner Foust back in the driver’s seat of his drift Passat. 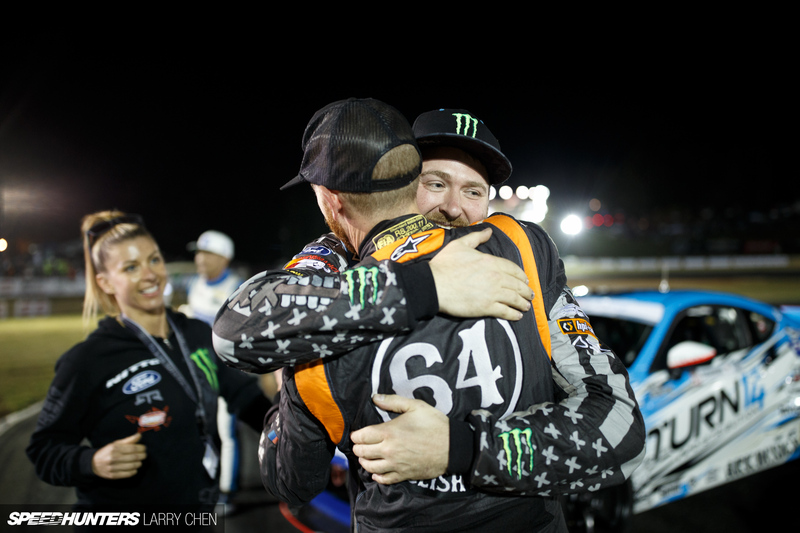 It’s just insane how much Tanner fits into a year of racing; between filming Top Gear and racing in Global Rallycross it just blows my mind. 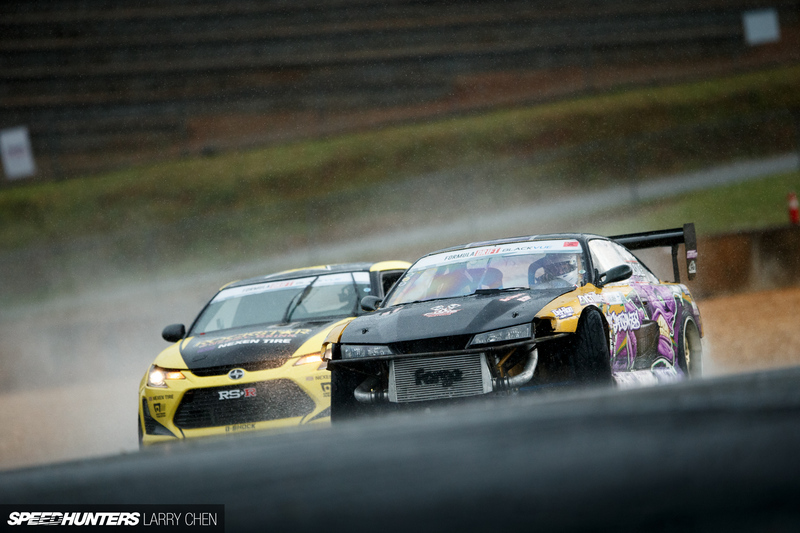 Formula Drift has been plagued with some sort of rain curse for the past few years, but of course it’s expected at Road Atlanta. Lucky for us, the rain only came during Thursday practice. 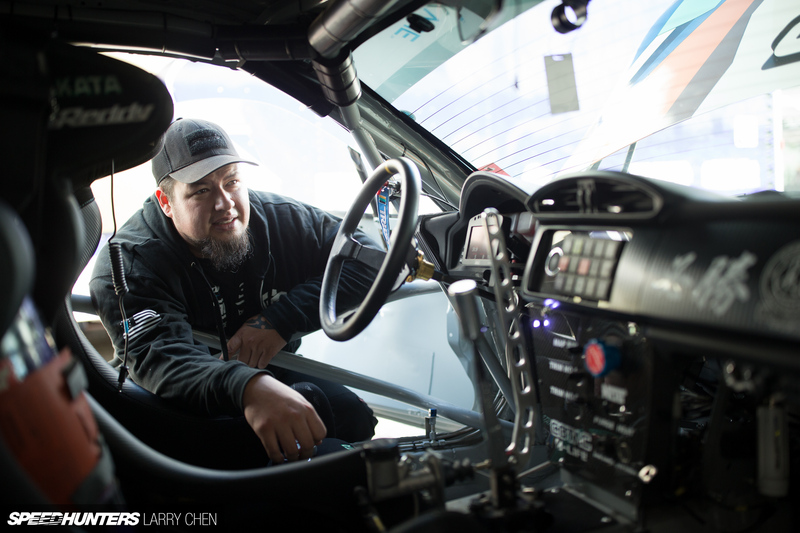 Dai Yoshihara fancies himself as a cameraman when he’s not behind the wheel. He definitely has the stance for it. It was a tough event for Fredric Aasbø and the Papadakis Racing team as they had to change an engine right before Top 32. It led to them use their competition time-out, which resulted in Fredric getting knocked out in the first round due to a de-beaded tire in his battle with Jeff Jones. Thursday practice provided some nice rain photo opportunities. I was pretty soaked afterwards, but anything for the shot. This has always been one of my favorite shots at Road Atlanta. It’s when the drivers are just going back up the hill to the starting line, but they have not quite stopped drifting. 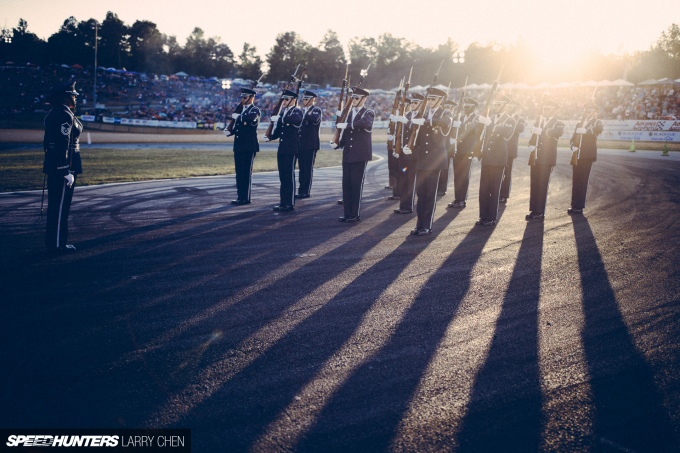 Because there is no more Friday practice, I only had a chance to shoot this during the actual competition. Shooting through the fence is not always bad, and sometimes you can find interesting textures. This is a great example of an awesome backwards entry going down the hill into the first turn. 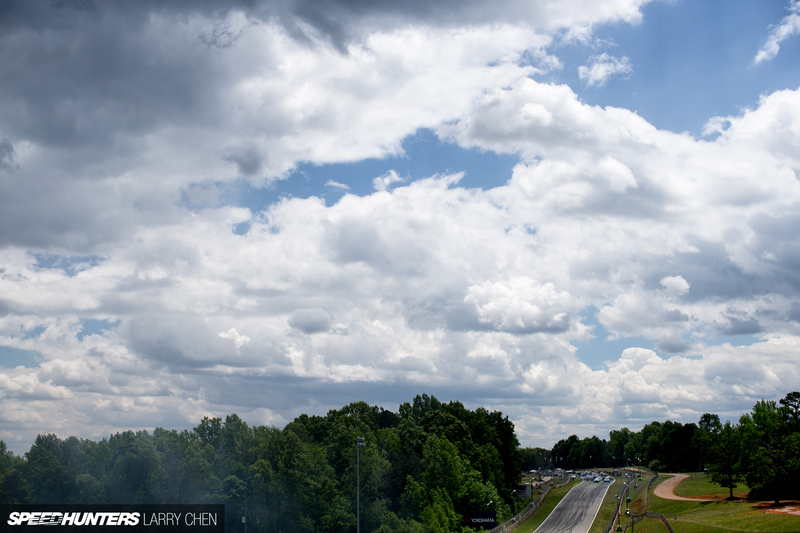 When it’s cloudy at Road Atlanta the light changes several times an hour. It’s so nice when you get that window of sun but there are still lots of clouds in the background. It’s the little things that count. The GReddy Racing team was showing off their new windscreen defogger to me as they were previously having trouble with the glass misting up. 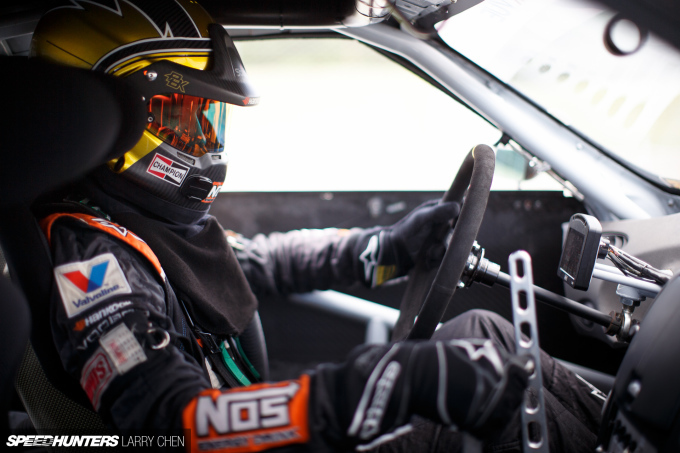 Most of the other teams don’t have this problem because they run with their windows down, but Ken Gushi does not like wearing arm restraints, so he has to run with windows up. While everyone in the paddock prefers the new course layout at Road Atlanta, I actually like the old layout, where drivers had to drift all the way down the hill, better. It was one of the most unique shots I’ve ever seen in drifting. 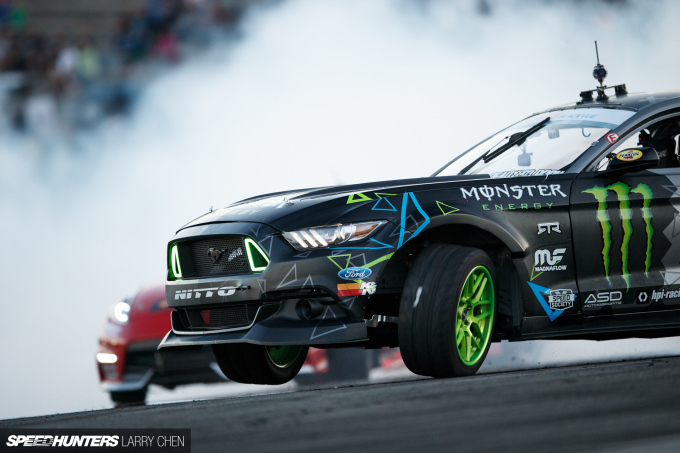 It was only a matter of time before Vaughn Gittin Jr. and the boys at ASD figured out the new Mustang chassis. 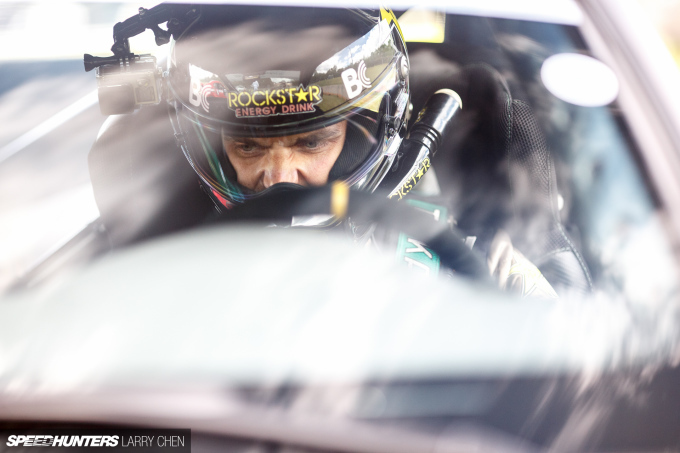 It was one amazing qualifying run that put Vaughn in the top spot. In terms of epic battles, this one pretty much took the cake. The old school veterans battling it out with the new kid on the block. Ryan Tuerck did not have such a great event as the team ran into engine troubles in the Top 32. There’s nothing worse than popping a motor during competition. This year in Atlanta the Top 16 started a bit earlier, which was nice because we still had some light for the first few battles. 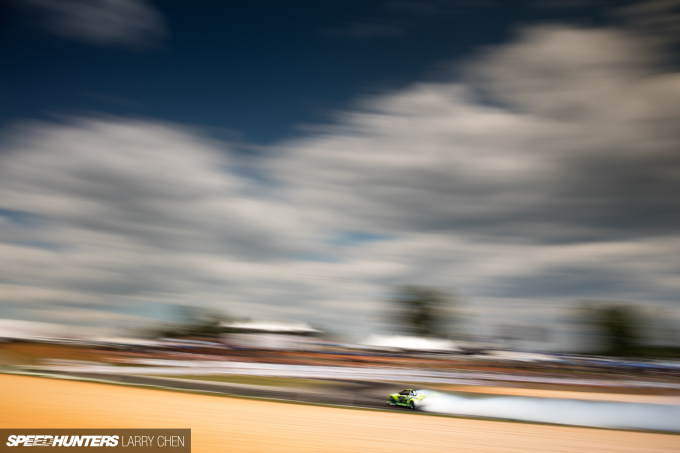 This is my favorite tandem shot from the weekend; the cars are just perfectly spaced out. 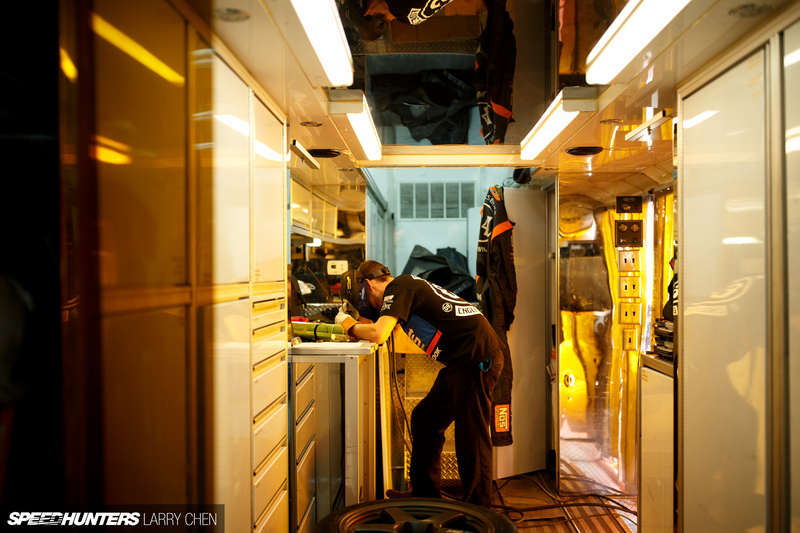 So much goes on behind the scenes in the pits and back at the shop. 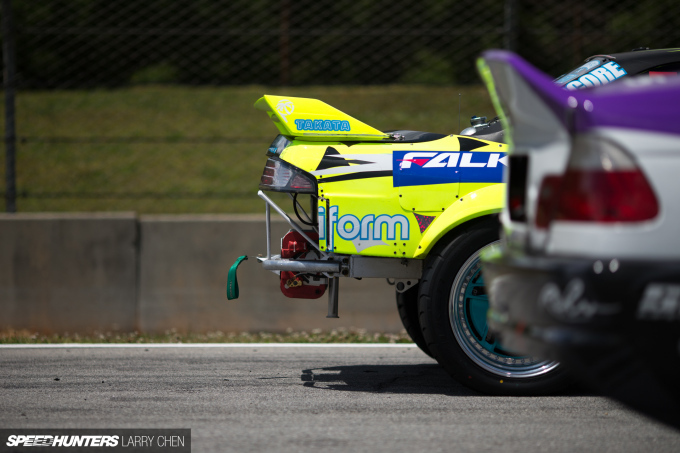 These machines are so far removed from bolt-on turbo kits and stock transmissions now. The crew that you have with you is of utmost importance, and Vaughn surrounds himself with quite a few of his friends and family. 240SX for sale by owner. Clean title. Barely used. Never drifted. Has new body kit. Nice wheels. New drift fans always ask me why the tracks are not longer. 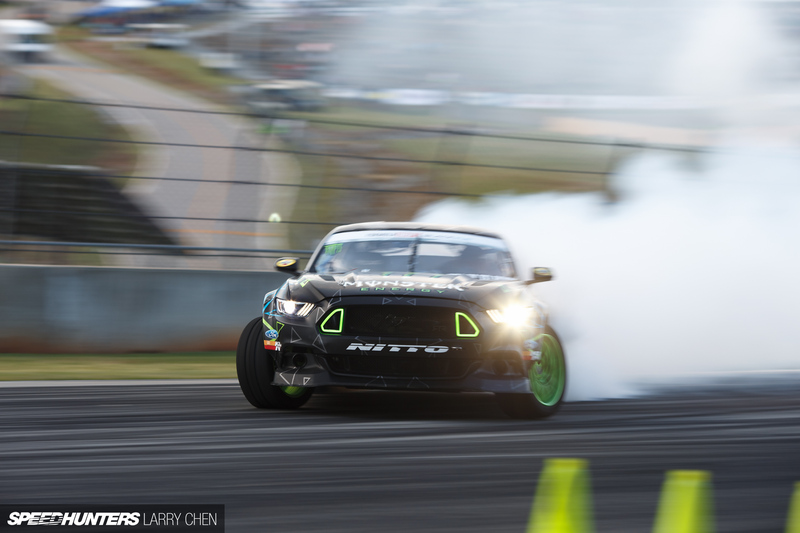 To put it simply, with the amount of power these guys are making now, they can barely get two runs from one pair of tires, as it is for the longer tracks in FD. 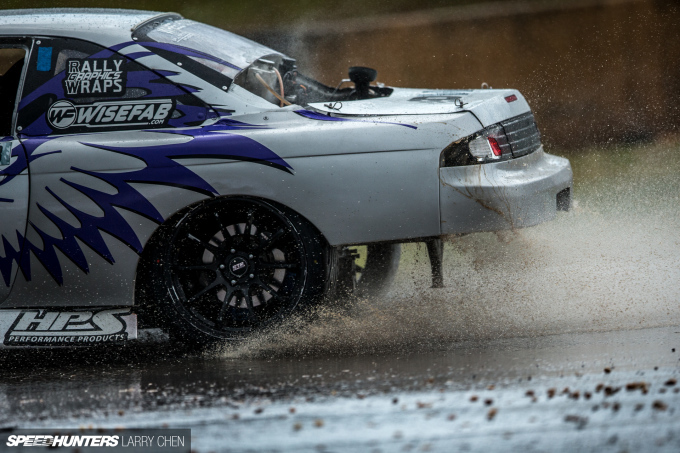 It wasn’t so long ago that drift cars actually had boots. This sport evolves so quickly. 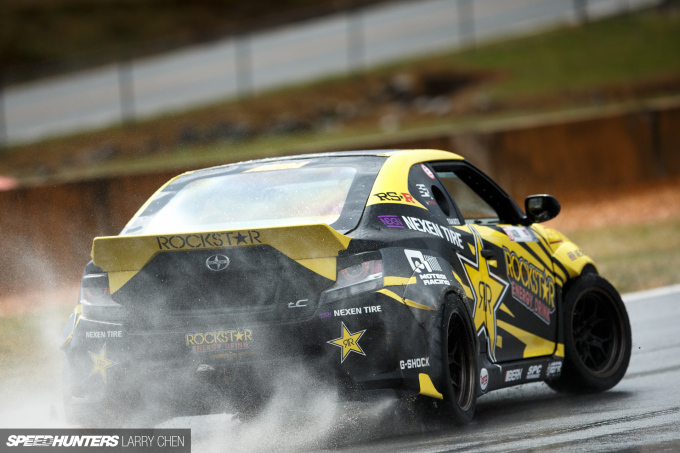 If you guys like Ryan’s video series Tuerck’d, then you’ll love Drift Garage. 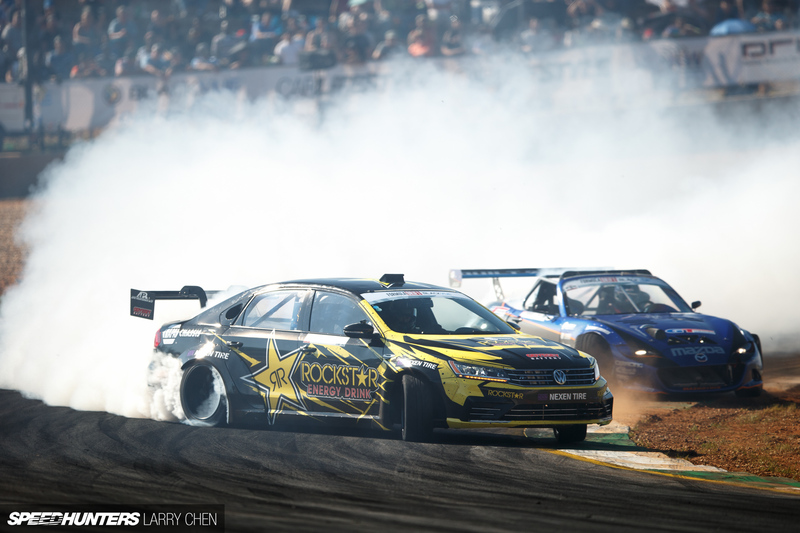 Tuerck and Forsberg make a fun duo. It’s nice to get out of the city every now and again. We don’t often see skies like this in Los Angeles. 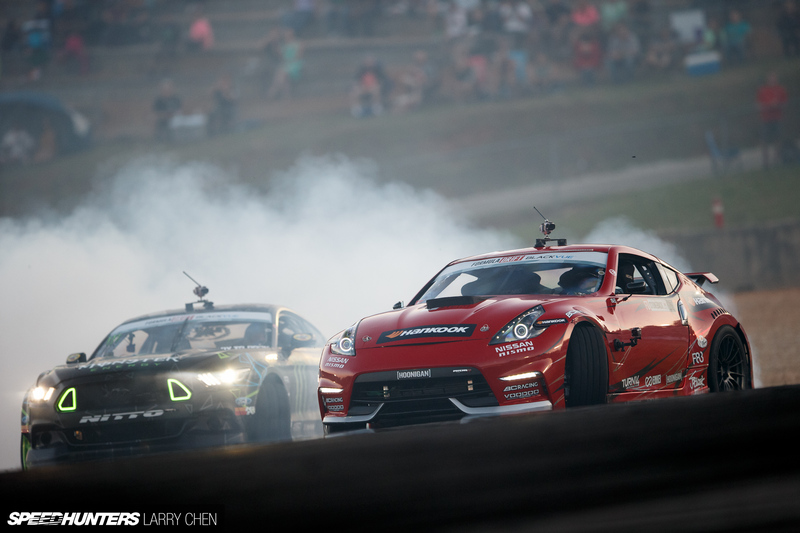 FD Atlanta was not very kind to Ken Gushi as he and the two other SR Racing by Toyota drivers were knocked out in the Top 32. 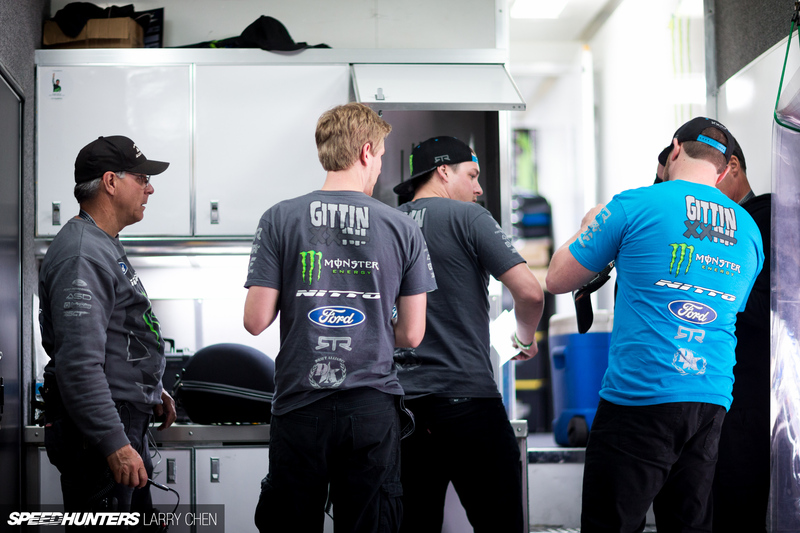 The team work hard for the entire weekend, so hopefully they figure things out for Round 3 in Orlando, Florida. Sometimes you just have to take a break from working on your drift car. I think I speak for everyone when I say I’m glad that Michael Essa is back behind the wheel of a BMW. Although, he is not the only one driving a BMW this year and raising eyebrows. Chelsea Denofa unfortunately lost the points lead. With a Top 32 loss so early in the season, it’s going to be tough for Fredric to defend his championship. 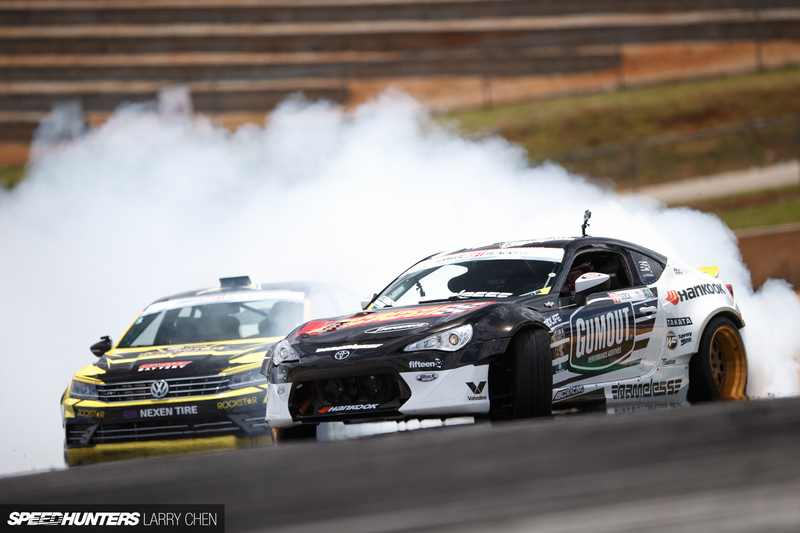 Although, this would be the year to do it, as for the first time ever there are eight rounds in the FD series. Just like clockwork, every night they roll them in and every morning they roll them out. Charging up the hill at warp speed. 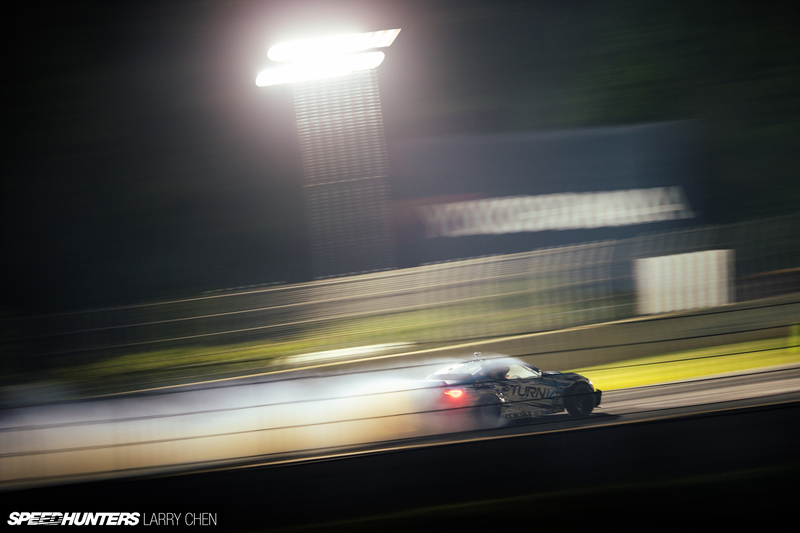 There is a drift car in the picture somewhere. Apparently you’re not doing it right if you’re not driving on three wheels. 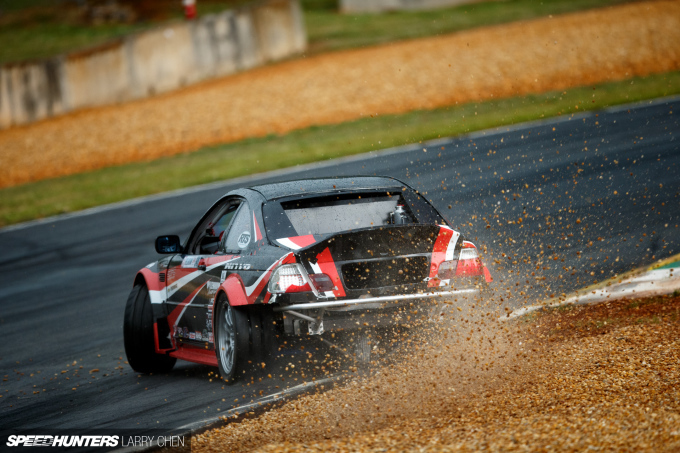 I love this type of shot; I caught the perfect moment when Pat Goodin gave the e-brake a slight tug. It wasn’t so long ago that half of the field was towed into the paddock with open trailers and pickup trucks. Now look at these guys. 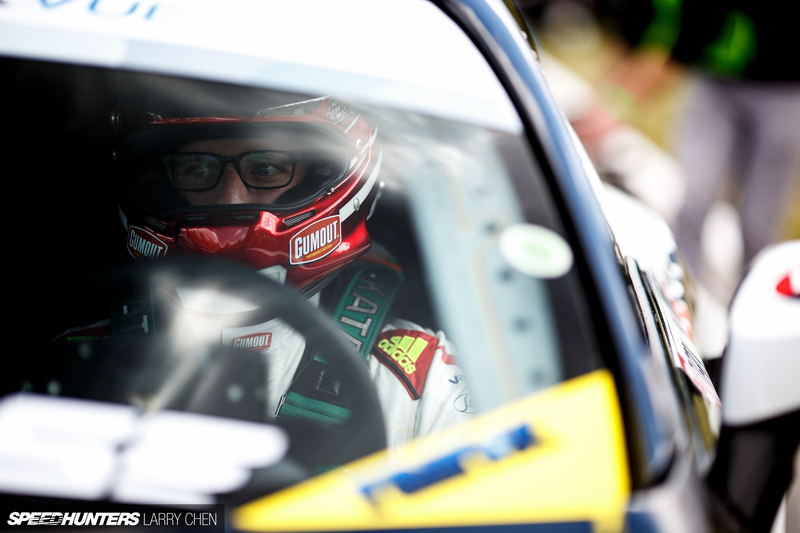 Juha Rintanen apparently has another competition car in the form of an S15 coming from Europe. I am curious to see how he will do in an updated chassis. I’ve said it before and I’ll say it again: JTP’s Mustang has one of 2016’s best looking liveries. Will Vaughn be able to clinch a second championship this year and join his Drift Alliance brother? Chris Forsberg is the only FD driver with two championships that is currently competing. 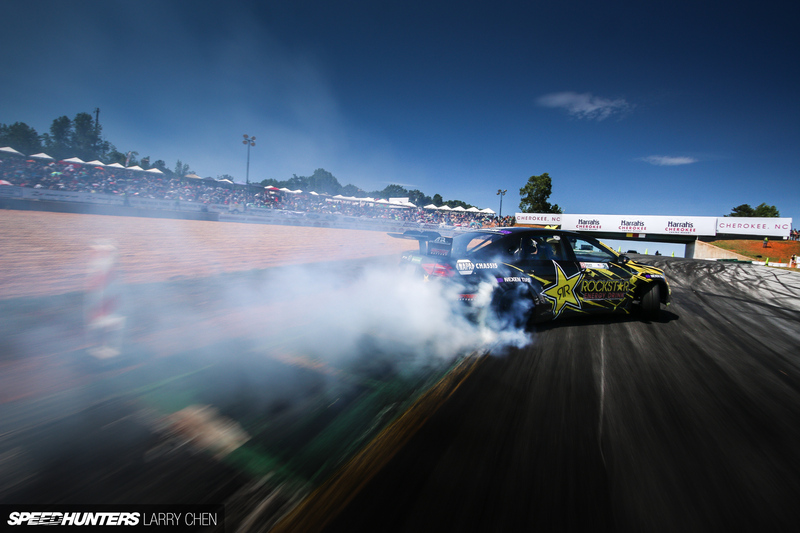 I call this the classic drift pan; showing mostly the front of the car and shooting slow shutter with a long lens. It’s so awesome to see Dai back on the podium; the fact that he has not tasted champagne for three years is just crazy. It’s cool to see that the team finally has the car dialed in. There were so many classic battles during practice. It was like 2008 all over again. I have no idea how Kyle Mohan can see where he’s going with all the tire smoke filling his convertible’s cabin. Seeing as I feel like I’ve shot from pretty much every angle this track has too offer, I really went out of my way to find new shooting positions. Surprisingly, I did find one new angle this year; it was the perfect spot to shoot the entry. It was also nice because I could get the drivers coming back up the hill after a run. High speed entry. This was actually shot from Kenny Moen’s car before he hit Vaughn going into the first corner. That one clipping point cone on the entry had to be replaced more than any other. I’d say, on about half of the runs someone would knock it over. 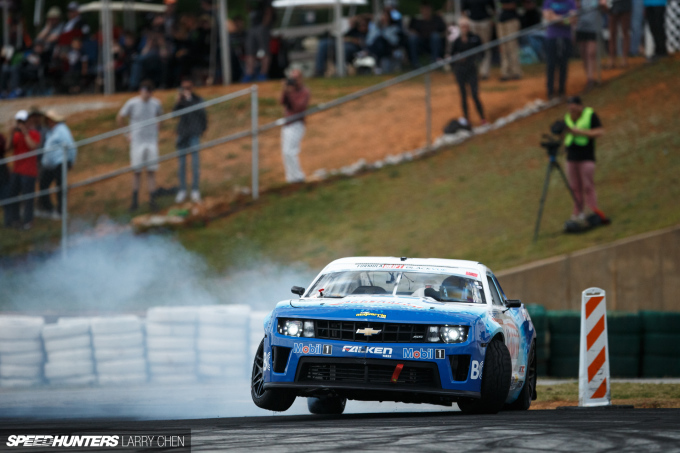 My favorite part of shooting at Road Atlanta is when the car sort of just melts into the asphalt of the track. The opening ceremony is always a great indicator that the end of a hard working weekend is near. 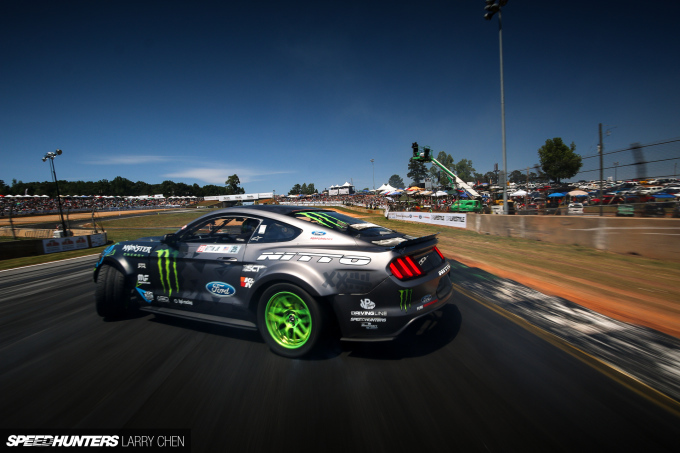 Forget drifting on all four wheels, how about two and a half? Somewhere in Tyler McQuarrie’s cloud of smoke you will find a Mustang. There really is no better crowd at any drift event. These guys are just hilarious. Not the final battle, but it might as well have been. Chris versus Vaughn was one of the closest battles of the night. Well, that’s it for my FD Road Atlanta coverage. 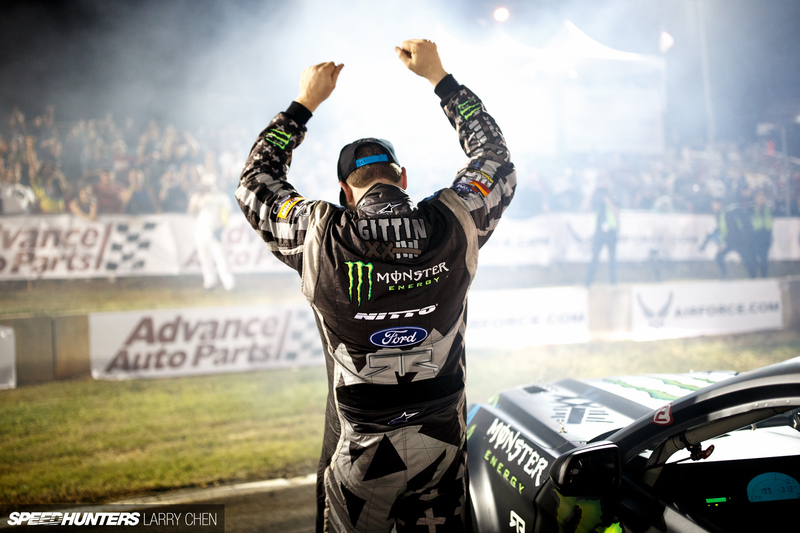 I hope you enjoyed the photos and once again congratulations to Vaughn Gittin, Jr. for the perfect event. 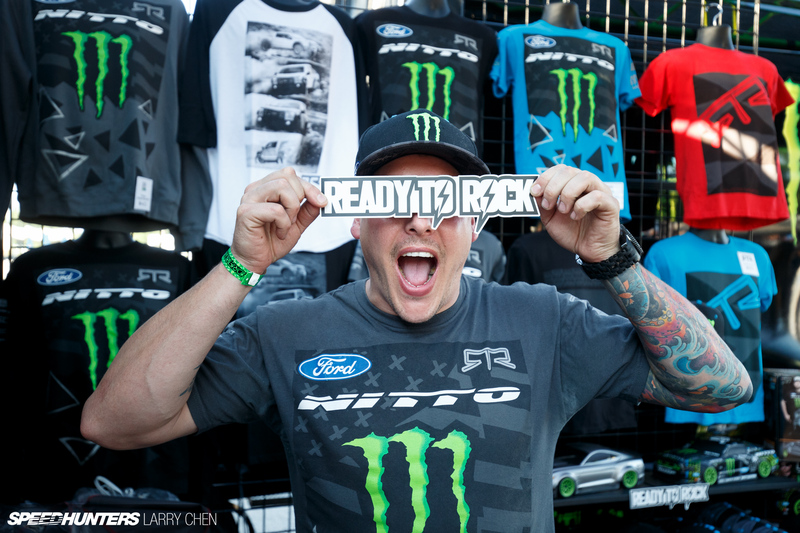 See you at FD Orlando! But first... SHUT THE UP. More like Waste of TIme, or Garbage TIme. Calling bonus images for this is akin to calling more time in a jail cell bonus time. An article about the guys in the Pro 2 division would be great. They are the future of the sport! Any photos of that amazing stud of a luchador??? I wanted to see Forrest rip and he didn't disappoint. Did you get any photos of Dai and Fors circling each other at the end? 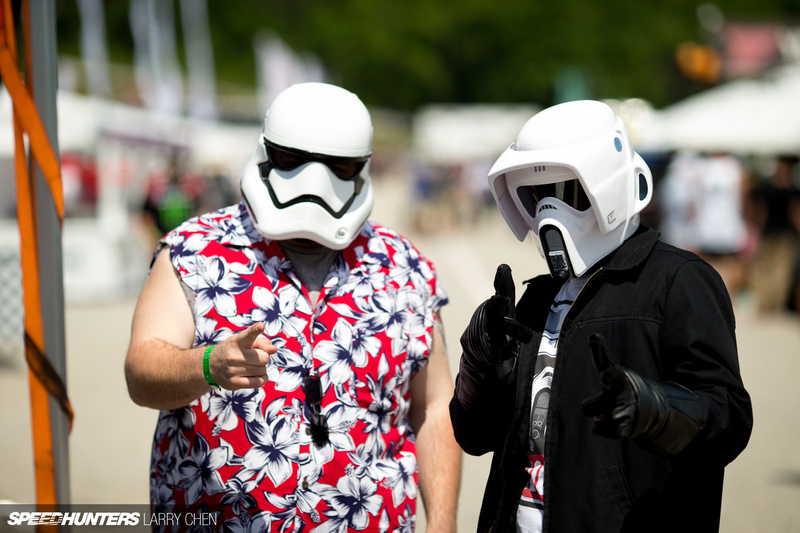 I can't believe our troopers made it on here! I'm gonna try to be in full armor next time. We're on to Forsberg. He's part of the Rebel Alliance and a traitor! Thanks for the picture, Larry! Larry Chen I tried to NEEPL TWEEST him. Any chance of an FIA based Drifting World Championship? HOLY CRAP that's me taking the selfie with the models lol. @Bob Unlikely, or let's hope not in my case. The FIA is the governing body for world motor sport and the federation of the world’s leading motoring organizations. 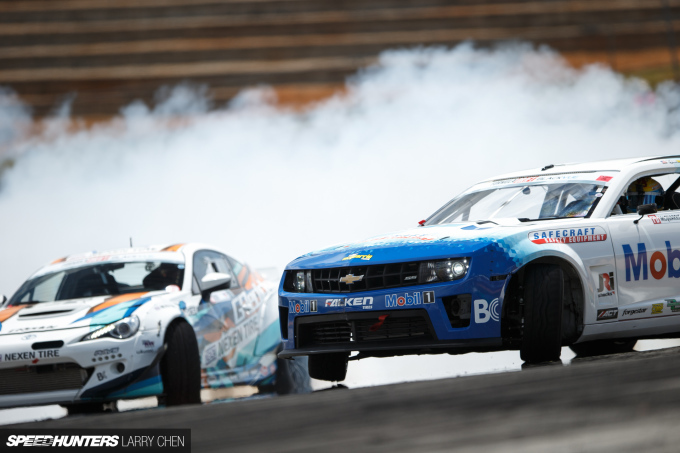 Motor sports events winners are objective in nature, drifting is not. 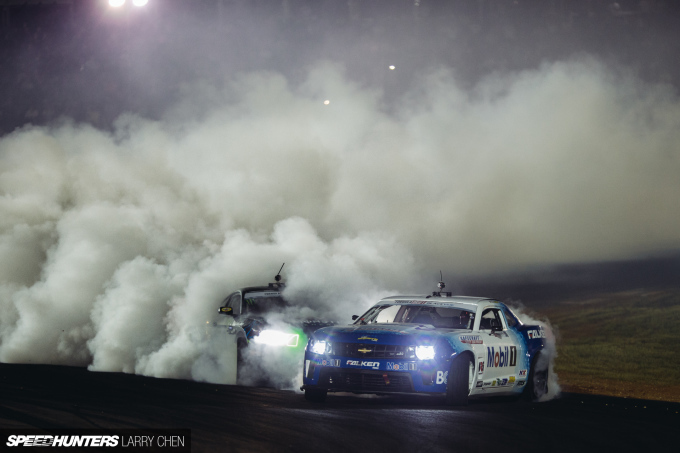 Drifting is good fun and a good show, more an entertainment event than an actual motor sport. For a race the winner driver crosses the finish line first after a finite numbers of laps. 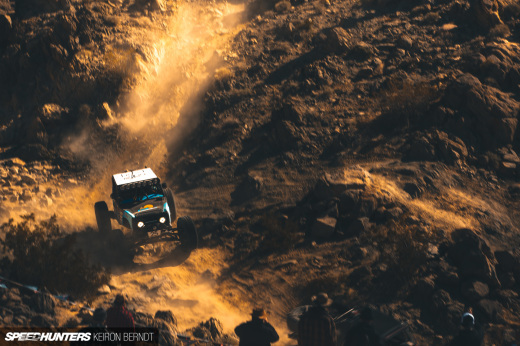 For a rally the winner is the driver who completes the course in the least amount of time. In drifting the winner is decided by a judgement or assessment that is subjective. NicholasMaher Just because it isn't numbers based doesn't mean that it isn't an actual motorsport event. Figure skating and gymnastics aren't number-based, but they're still athletic events in the Olympics for a reason- they both still require incredible amounts of skill and control, with the differences between competitors being clearly evident to anyone familiar to the form. Besides that, "subjectivity" isn't really a factor in many drift competitions- major formats like Japan's D1GP have gone with a more objective judging using computers that measure entry speed, drift angle, and position relative to a preset line in order to come up with a point-based score. That's a potential solution to your "problem". @Bob If you think it is expensive now, you don't want the FIA. Just read some of their class rules for starters. http://www.mulsannescorner.com/2015LMP1.pdf - these are for LMP1, but you will get the idea. What, no mad Mike piccys? Something wrong. Great to see Kyle mohans mx5. More Rota pictures please. Fournafish Well, it does for me, and others. A more accurate description would be reality based versus judgement based. 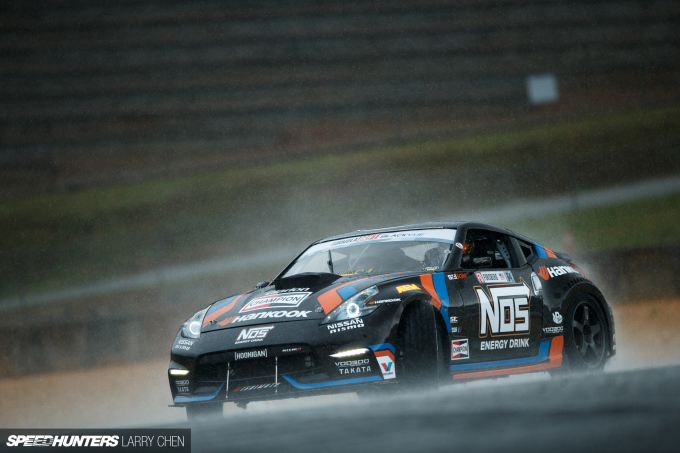 While drifting is a competition and is done in engine powered vehicles it exists at the very edge of (if it’s not an outlier) the definition of motor-sport. Comparing it to figure skating and gymnastics places squarely in the category of an exhibition, which it is. I’m not saying there isn’t skill involved in any of those endeavors. Cool cool cover the big teams why not show us some of the smaller guys. @Nick Sure there are a bunch of ugly cars this year but there are a few good looking ones too! Have you ever seen Forrest's car in person? That car is a master piece (although I did like it better last year but it still looks good this year). And Alec Hohnadale's car is just as good looking and well built! And to round off my argument, Gushi's car has looked pretty good for like 2-3 years (plus he runs authentic wheels which I like and is harder to find in the drifting world these days lol) Please take a closer look at the field before putting a blanket statement like that out there. 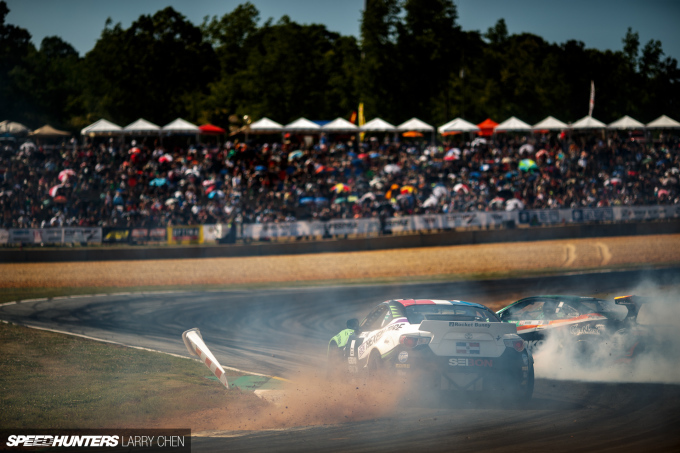 NicholasMaher In short, drifting is not a motor sport, then? rally2727 That's my take anyway though I can see how some people see it as a motor sport. I don't see sport where the winner is chosen subjectively. 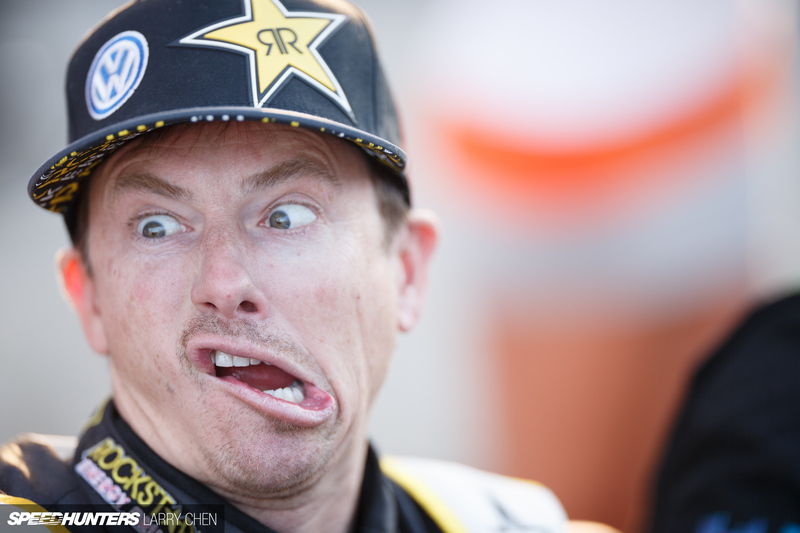 In all other motor sports the winner is the fastest car/driver combination, objectively.